The tranquil graveyard at Trinity Church is tucked into an otherwise bustling commercial corner of Lower Manhattan. 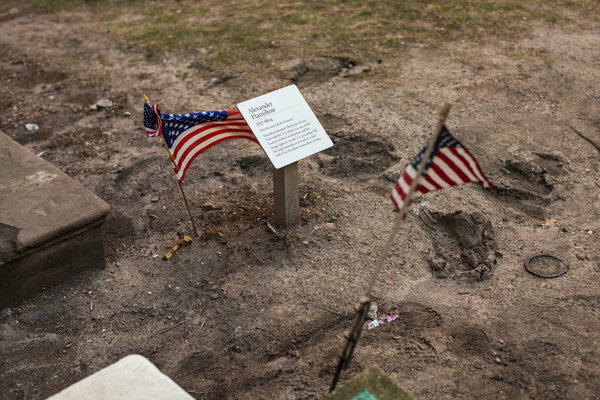 Inside its gates, weatherworn headstones — some dating from the 1680s — stand in the shadows of skyscrapers. Alexander Hamilton, a founding father and the first secretary of the Treasury, has long been one of the cemetery’s most famous residents. But in the 212 years since a duel with Vice President Aaron Burr claimed his life, he may never have had the volume of visitors he’s had in the last six months. “Hamilton is having a moment,” said Anne Petrimoulx, the archivist of Trinity Church. While giving tours, she said, “I used to say, ‘You might recognize him from the ten-dollar bill.’ Now I say, ‘You might know him from the musical.’”At his New Year’s Eve concert at the Barclays Center in Brooklyn, Jimmy Buffett sang his hits about island life before a backdrop of virtual palm trees and Caribbean waves. But somewhere between “Margaritaville” and “Auld Lang Syne,” he paused on a surprisingly pensive note to tell the crowd how he spent the final day of 2015: visiting Hamilton’s grave. In a recent phone interview, Mr. Buffett, who is developing a Broadway show of his own, said that while he has long been interested in Hamilton’s life, seeing “Hamilton” ignited his passion. The show has this effect on people. When the curtain falls at the end of Act 2, many audience members aren’t ready to let go. They hunger to know more. Visits to Hamilton’s house at the Grange National Memorial in Harlem went up by 70 percent in 2015; a Hamilton-themed walking tour of Hamilton Heights and Washington Heights began last month. The dueling pistols are on display at the New-York Historical Society. Hamilton is also popping up in less likely corners. SoulCycle’s “Hamilton: A hip-hop theme ride,” sells out in a flash whenever it’s on offer. At Fishs Eddy, a popular dishware store, there has been a run on the Dueling Shots Gift Box. It contains two shot glasses with pictures of Hamilton and Burr. But there is something unique about the grave’s significance to a show that is in large part about the meaning of legacy and remembrance. 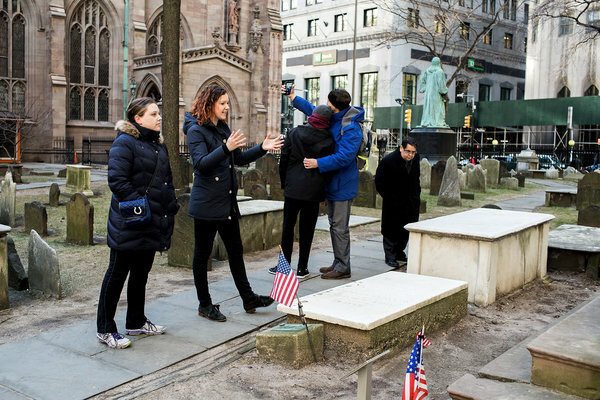 Ms. Petrimoulx said that in recent months, more young people have populated her tours, curious not only about Alexander Hamilton but also about other characters from the show who are buried at Trinity Church. Eliza Hamilton died in 1854 at the age of 97. Her grave, a plain white marble slab at the foot of a far grander monument to her husband, bears the words “Daughter of” and “Widow of.” Little more was known about her until “Hamilton” (and the Ron Chernow biography on which it is based) brought her accomplishments to light. She founded the first private orphanage in New York City and advocated for the construction of the Washington Monument, among other things. Now she has a fan base all her own. The same can be said for her sister, Angelica Schuyler Church, whose romantic feelings for Hamilton provide one of the musical’s most bittersweet plotlines. Founding fathers aside, Lin-Manuel Miranda, the creator of “Hamilton,” has said that he considers her the show’s smartest character. “When I was a kid, I dreamed of being Evita. Now I dream of being Angelica,” said Carmen Lamar, an actress and the Junior School director at the Neighborhood Playhouse School of the Theater in Manhattan. After falling in love with the soundtrack, Ms. Lamar and her husband started entering the lottery for $10 same-day “Hamilton” tickets, taking turns waiting outside the Richard Rodgers Theater on 46th Street. They tried 27 times without success. Ms. Lamar took pictures and texted them to her husband, who was waiting in line for the lottery. She jokingly wrote, “Should I ask Alex for tickets?” An hour later, her husband reported that they had won a pair of front-row seats. “Hamilton” is sold out through November. For those unable to get tickets, a trip to the grave may be the next best thing. That was the case for Alan Bone, a teacher from Omaha who visited New York with his wife in November. They were shut out of the show but still went to Trinity Church. “I didn’t want to pass up the opportunity to visit the site,” he said. While paying their respects, Mr. and Ms. Bone encountered the actor Ben Stiller and his daughter, there for the same reason. Mr. Bone offered to take a picture of the Stillers in front of Hamilton’s grave. Then Mr. Stiller’s daughter snapped a shot of the two men, which Mr. Bone later posted online. Though Eliza Hamilton was a dedicated parishioner at Trinity Church, it is not known whether her husband regularly attended services. But from his deathbed, Hamilton sent for the Rt. Reverend Benjamin Moore, rector of Trinity, bishop of New York and president of Columbia College. Hamilton died on July 12, 1804. Two days later, his body was prepared at the home of Angelica and her husband, John B. Church, and then paraded to his grave. Thousands lined the streets to say goodbye. The Patriot of incorruptible integrity. The soldier of approved valour. The statesman of consummate wisdom. Long after this marble shall have mouldered into dust. The C.E.O. of ‘Hamilton’ Inc.